Posted in Press Releases on November 1st, 2013. Books will be distributed at the Forever Family 5K Run and Walk sponsored by the FamiliesFirst Network of Lakeview (FFN) in honor of National Adoption month. PENSACOLA, Fla., November 1 — Any child who rides a school bus can benefit from more safety education concerning the big yellow bus. In an effort to spread this message of safety, School Training Solutions, a leading provider in driver training for school bus drivers, is donating “Carmen Loves the Bus” books to every participant in the upcoming Footprints to a Forever Family 5K Run and Walk. These books are geared toward young children who are beginning to experience school bus transportation. 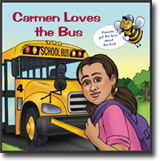 The “Carmen Loves the Bus” book was created by the American School Bus Council as a way to educate young children about school bus safety. “We received permission from American School Bus Council to reprint these wonderful books, and I look for new ways to get them into the hands of children and parents,” says Patrick Willi. The Footprints to a Forever Family 5K Run and Walk event is an ideal match for handing out the books because of its focus on children and families. November is National Adoption month and a time to celebrate the families created through adoption. The Footprints to a Forever Family 5K Run and Walk proceeds raised will go to share the message of the need for more adoptive families to help waiting children find a forever home. The 5K run and walk takes place Saturday, November 2, 2013 at 8:00 a.m.
FamiliesFirst Network of Lakeview (FFN) represents a partnership with the Department of Children and Families (DCF) to provide an array of foster care and related services in coordination with network partners. The network includes DCF, Lakeview Center, as the lead agency, judiciary sub-contracted service providers, foster parents, the District One Community Alliance, agency stakeholders, and the community working together to implement the legislative mandate for community based care. Services include case management for out-of-home and in-home placements; foster home recruitment, training, recommendation for licensure, and support; adoption support; independent living program; dependency court resource facilitation; sub-contract management; and other related services to abused and neglected children and their families.